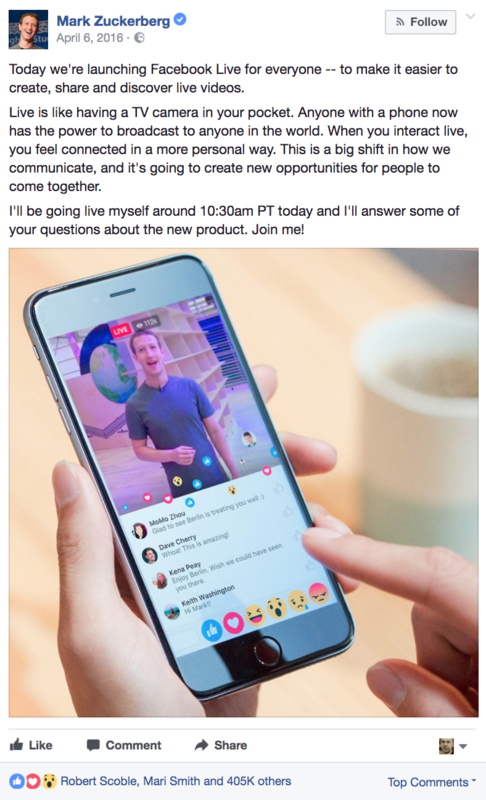 In early 2016, Facebook launched their Facebook Live live-streaming option, with CEO Mark Zuckerberg making the announcement himself via the new feature (of course). But more than a year on, brands, it seems, are still not making the most of the option. As the most popular social media platform in the world - with more than 2 billion users - Facebook provides a range of ways for brands to engage and interact with their audience. Tools like Facebook Live give companies the capacity to showcase the 'behind the scenes' elements of their process, to portray the human element, which is important when looking to connect via social networks. Facebook Live is the most sociable and genuine way to communicate key messages to a following; it's in the moment, as it's happening, uncut and real. It's real people conversing and engaging with other real people. Facebook Live works as a window into the inside life of a company, beyond polished exteriors and branding. In addition to this, Facebook Live is also user-friendly. Whether you're an experienced Social Media Manager with a whole team behind you, or a marketing exec at an SME juggling all sorts of outreach, Facebook Live is easy to use. Whether you plan to stream via your phone or you've invested in swanky film equipment, Facebook Live has the capabilities to hook up to many different devices and cameras to ensure high quality and effortless streaming. And there's more - here are some other benefits of Facebook Live which are worth considering. Facebook Live's Simulcast function enables Social Media Managers to stream live to more than one Facebook Page at a time. Maybe you work for a chain of high street restaurants, or a string of contemporary gymnasium start-ups who have individual local Facebook Pages as well as an overall umbrella brand page. Simulcast enables you to stream the same live video to all selected Pages at once (as long as the facilitating user has admin access to all the desired Pages) - ideal for expanding reach and exposure. Despite being one of many social platforms offering a live experience, Facebook is by far the most developed. The platform's built in notification system lets users know when a Page they like is 'going live' - Facebook even has capabilities that enable a Page to promote a live video in advance while also letting users set reminders so they don't forget to tune in. This built in functionality is great for expanding reach and exposure, and is ideal for premeditated events and celebrations. After finishing a live video, Facebook gives you the option to save the video to your phone's camera roll, meaning you've got it for playback and further marketing use later. Plus, once your live broadcast is over, your video turns into a standard video that lives on your Facebook Page like any other post, -meaning the content isn't only available at the time of going live. So, if your biggest fan wasn't able to tune in for your live stream, they can catch up later. Who remembers the viral Chewbacca Mom video last year? You can't forget it. This video was originally recorded live, but since the stream stayed on Facebook after the initial broadcast had finished, it soon became the most watched live video of 2016, racking up 170 million views by the end of the year. Facebook, as an overall social platform, has well-developed in-stream analytics. 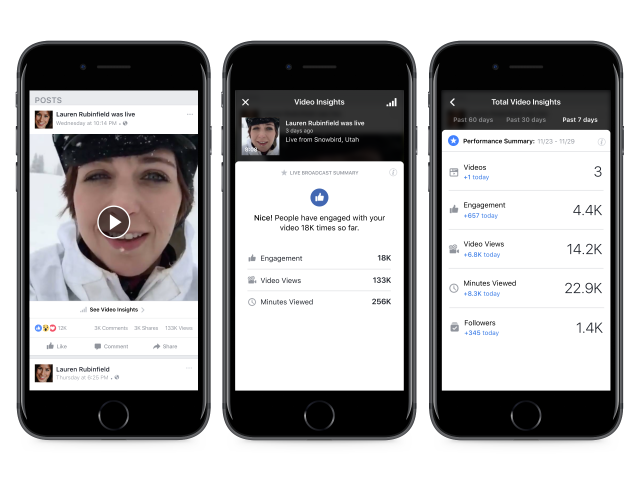 In addition to the standard Facebook Insights video stats, Live analytics have been refined even further to offer information on peak live viewer figures, total reach, reactions, comments and shares. Having access to this user-friendly analytics dashboard makes it easy for you to see what content works and what doesn't. Checking in on your analytics is vital to the success of your Facebook strategy; knowing what type of live content your audience responds well to means you can create more of it. Despite other social channels, like Instagram and Periscope, also providing live-streaming functionality, Facebook's set up has been developed for longer videos with slightly more substance. Instagram, Twitter and Periscope are ideal for spontaneous short live video, people turn to these channels for quick updates and snippet insights of casual and fun stories. 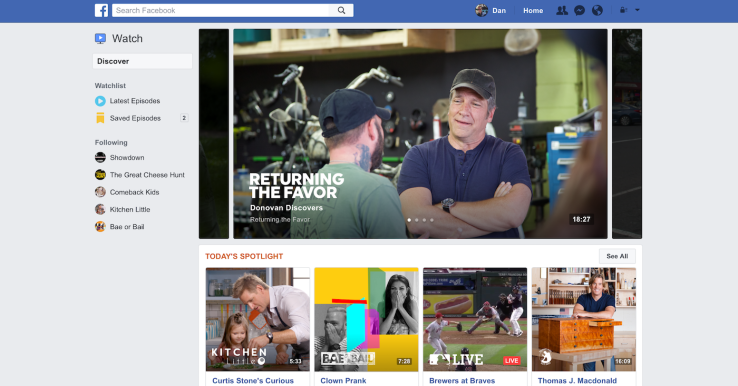 Facebook's unique interface means people are prepared to spend longer watching live videos on the platform. The in-app pre-promotion and reminder system creates hype around live events and therefore cultivates an audience prepared to indulge fully. In fact, Facebook allows users to film up to four hours of live content in a single stream, making it the perfect platform for showcasing more timely events, such as gigs and conferences. Facebook says that one-fifth of the videos posted to their platform now come via Facebook Live, and that users spend 3x longer watching video when it's live, compared to pre-recorded or saved video. That's a lot of people spending a lot of time viewing Facebook Live content - and that's only going to increase with the introduction of their video-focused 'Watch' platform. Facebook, unlike some of the other competing social channels, allows you to write a caption along with your video. And although its simple, a caption is a great way of enticing viewers. Facebook's Live interface also displays comments on the Live post in real-time, enabling the subject of the video to communicate and interact with viewers. The ability to reply to comments and converse in the moment lends itself to creating meaningful customer relationship without parameter. On top of that, research shows that 85% of people say they're more likely to watch a live broadcast on Facebook than on TV because of the opportunity to get involved and interact. Facebook also reports that comments on live videos increase ten-fold compared to standard video content. In such a busy world, where we're constantly surrounded by brands and logos, advertising and marketing is a must. With billions being spent on forming customer relationships each year, Facebook Live is a refreshing and low-cost way of connecting with an audience. According to Digitell, 30% of audiences watching the live stream of an event will buy a ticket to attend the physical event the following year. Take Coachella for example - in 2011 it took the festival three days to sell all of its tickets, and in that same year Coachella used Facebook Live to steam its events. The consecutive year saw tickets sell out in just 3 hours. As you can see, there's plenty of potential benefits to Facebook Live, but as with all social media - and live events in particular - there are some things to watch out for. If you plan to take your brand live, it's always a good idea to have a Social Media Manager or CRM on hand to answer any questions or defuse any debate that may erupt in the comments. Filming live leaves a little less room for control. Live is uncut and unedited, great for showing an audience a behind the scenes, authentic version of your brand - but not so great for the unplanned F* Bomb. Be aware and prepared for the unpredicted, and brief your team and crew thoroughly beforehand. 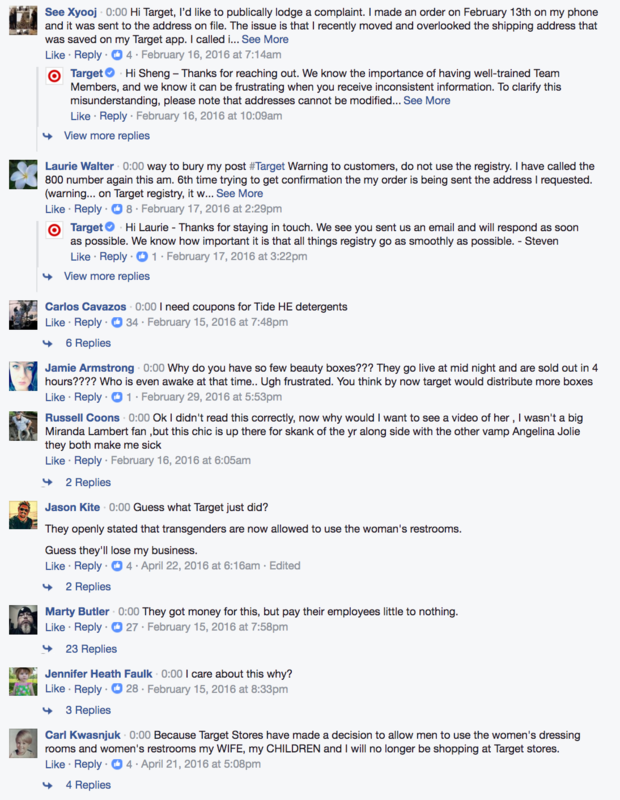 Although Facebook's capabilities seem much more developed than some of the other platforms, be sure not to rule the others out. As noted, Facebook's the most popular social platform, but other channels like Instagram are great for light-hearted, short live content, and should not go unconsidered. It's important to understand your audience and know what channels they're spending their time on. For example a majority young female users might be residing more on Instagram than Facebook, while young male gamers might be using YouTube Live as a preference. As with any marketing initiative, knowing your target audience and understanding their habits is key to getting the most out of any strategy.